Maybe I just don’t understand the planning process. It was my understanding that the Bicycle Advisory Committee for the new Expo Line extension was formed to get the input of knowledgeable bike riders prior to construction, in order to develop a safe, separated bike route stretching from the beach to Downtown to encourage more people to leave their cars at home. I didn’t realize that it was just an attempt at greenwashing. 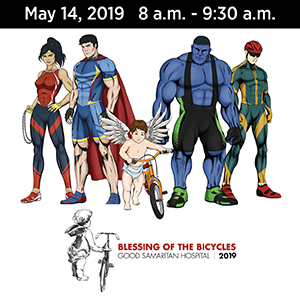 Or that the apparent purpose in forming the Expo BAC was simply to placate the bicycling community while dangerous, cost-cutting designs were forced through by those charged with planning and building the bikeway. At least, that’s how it looks right now. Members of the Expo BAC have complained both publicly and privately that their input has been ignored, and that corners are being cut in a rush to complete the designs and speed up construction. And that as a result, dangerous design flaws are being incorporated into the plans that will put riders at risk and discourage usage — ensuring the expensive failure of what has long been one of the county’s most anticipated bikeways, and which, if designed properly, should be one of the most heavily used. 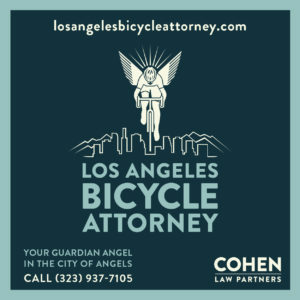 I implore you use your authority to step in and slow down the process, and require that those charged with designing and building the Expo line extension and its associated bikeway listen to the bicycling experts you yourself appointed, and work with them to incorporate their suggestions. The success of this project — and the safety of those who use it — depends on it. Tyler Farrar takes stage one of Colorado’s USA Pro Cycling Challenge, as Levi Leipheimer defends his title. The Denver Post asks why not let the peloton ride through the famous Tour of the Moon course through Colorado National Monument. Meanwhile, the uglier side of cycling rears up once again as the judge dismisses Lance’s case against the U.S. Anti-Doping Agency. Planning begins for a CicLAvia to the shore. The Los Angeles bike parking map is now available online. Once again, Beverly Hills goes for the short-term money, rather than open up the city for bikes and pedestrians. A Baldwin Park cyclist is injured after reportedly riding into traffic; funny how often cyclists are blamed after they’ve been taken from the scene by ambulance. 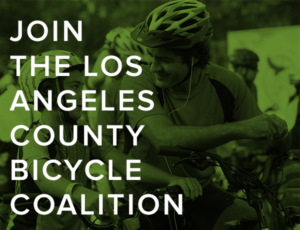 CLR Effect, aka the former Claremont Cyclist, reminds riders to contact their Assembly Members prior to Friday’s vote on the state’s proposed three-foot passing law; Better Bike urges you to help make safe passing a reality here. Long Beach considers signing up with Bike Nation. Orange County will spend $9 million to install 28 miles of new bikeways. Former World Champion OC cyclist Mark Hoffenberg still wears the rainbow bands on the podium. A 16-year old San Diego girl rides her bike to the hospital after being stabbed in a fight. A bicyclist hit by an Imperial County Irrigation District meter reader reportedly came out of nowhere, riding on the wrong side of the street. Sunnyvale becomes the latest city to adopt L.A.’s groundbreaking anti-harassment ordinance. A commenter first says cyclists need to obey the law, then says the law has to be changed when others point out what he’s complaining about isn’t actually against the law; thanks to former LADOT Bike Blogger Christopher Kidd for the heads-up. Neighbors say the 81-year old road raging motorist who drove onto a golf course to run down a cyclist is a nice, non-testy individual and say the rider must have had it coming; a writer says it’s time to change the conversation. A 75-year old Burlingame cyclist is killed after swerving into a truck passing from behind — something many cyclists would recognize as a possible reaction to a too-close pass. If you’re afraid to ride, try riding in ways that don’t terrify you at first. Too many people are dying on the streets of Las Vegas, the sixth most dangerous metro area in the U.S. Bikeyface suggests better urban planning. Seventy-nine year old Willie Nelson cancels a Colorado show, in part, due to a bicycling accident. A brief list of rules for riding in my hometown. Another day, another pedestrian injured by a New York cyclist. A Pittsburgh paper says cyclists aren’t always to blame in collisions; in fact, riders are only responsible for about half. 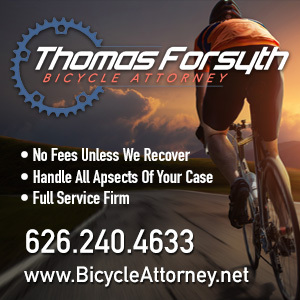 A Tampa Bay cyclist collides with a crossing guard trying to avoid a motor vehicle collision. Bicycling asks the Cannibal what made him the greatest cyclist of all time. Yet another list of the top 10 bike-friendly cities around the world — and once again, only one is in the U.S. ER docs think an injured Calgary cyclist suffered a stroke until GPS data shows he was the victim of hit-and-run. In just a tiny overreaction, a London cyclist spends a night in jail for riding in a no-biking zone. A London police office went airborne while driving at twice the speed limit before hitting a cyclist. A UK auto magazine says three-quarters of cyclists break the law — but cites offenses that aren’t against the law. An Aussie nurse saves a severely injured cyclist from an internal decapitation. Finally, Town Mouse buys a Paper Bike for her Mum. On a personal note, thanks to Bike and Hike LA for renting a bike to my 15-year old nephew from Colorado last week. After a highly enjoyable ride on along the beach, I think he’s even more committed to becoming an Angeleno at the earliest opportunity. And I learned that it is in fact possible to have a good time while riding slowly.